Howell's Bridge (09 0009) is a single span, steel 3-pinned, tied through truss arch. The concrete deck is supported with a floor-beam and stringer system on rubble masonry abutments. The bridge was built in 1933 and rehabilitated in 2002. The rehabilitation included replacing some of the rivets with high strength bolts and replacing the cross frames. 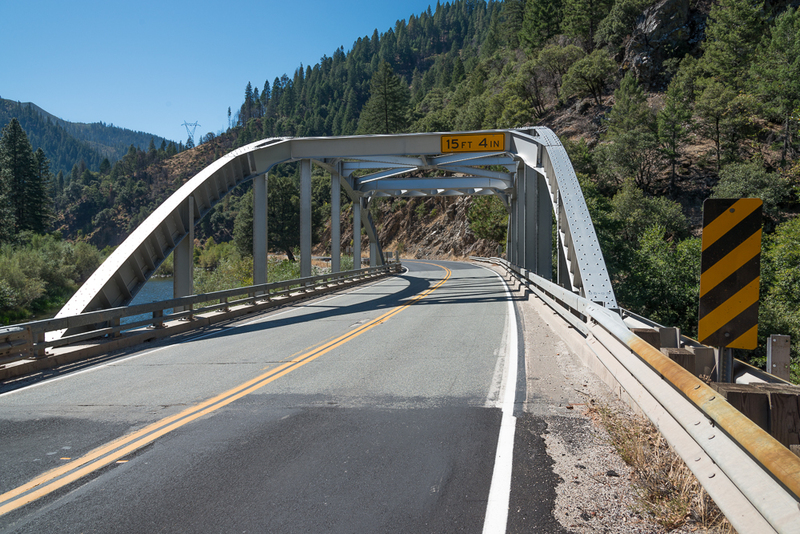 The bridge carries State Route 70 along the north bank and over the East Branch of the North Fork of the Feather River. 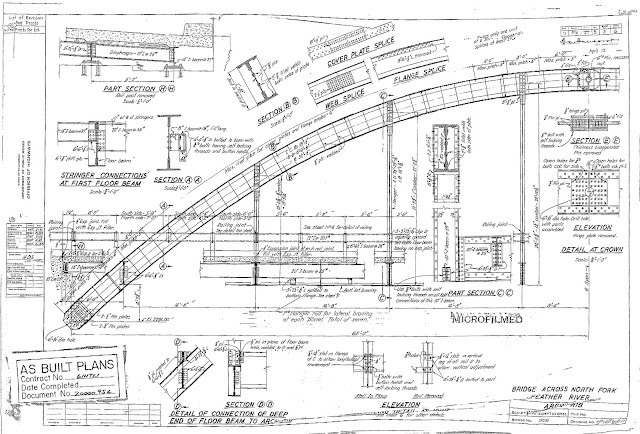 It looks like everything on the arch is made out of built-up members. For instance, the hangers are made of a steel plate with two angles on each end to approximate a wide flange girder. In the plan drawing shown below, we can see the holes for the pins at the top and bottom of the arch that turn it into a statically determinant structure (that's easier to analyze by hand). The arch descends below the horizontal tie to the abutment support (see drawing above and photo below), resulting in an eccentrically-loaded horizontal force on the arch from the tie. In the photo below we get a nice view of the steel stringers supported by big floor beams and the hefty bracing where the arches meet the abutment. Note the flimsy ties, which are suppose to hold the arch shape like the string on a bow. Perhaps some of that force is being resisted by the abutments? The last couple of photos provide views of the arch and its connection to the hangers and the bracing. We can see in the photos below that not all of the rivets have been removed. 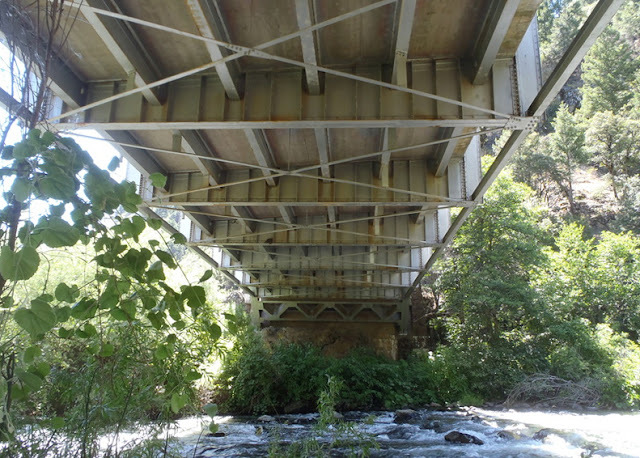 These photos were taken from the extended arm of Caltrans' snooper truck (seen above), which is used to inspect many of the bridges along the Feather River Gorge. Plumas County, California Bridges: Howell's (SR 70) Bridge across the East Branch of the North Fork of the Feather River by Mark Yashinsky is licensed under a Creative Commons Attribution-NonCommercial-NoDerivatives 4.0 International License.